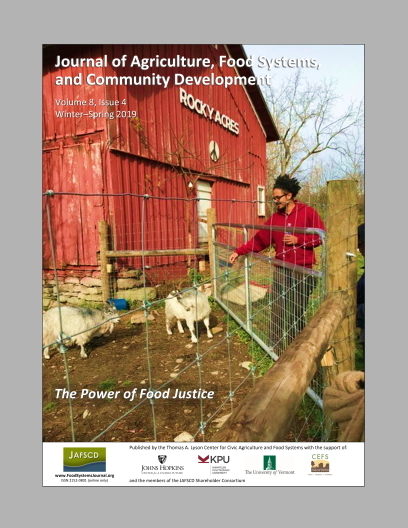 In this winter-spring issue, we feature a number of papers that illustrate The Power of Food Justice, including two papers about young African American farmers as well as the perspectives of food project stakeholders of color and of farmworkers. As depicted on our cover, farmers of color are growing as a share of all farmers in the United States, despite daunting challenges for these intrepid agripreneurs. We begin the issue with columns that raise two very provocative questions. In A New Day for Dairy? Teresa Mares and guest co-columnist Brendan O’Neill continue to highlight the work of the grassroots group Migrant Justice and the Milk with Dignity program to bring economic justice to dairy farmworkers in Vermont. Can a price premium for milk produced under fair labor conditions move the needle in a positive direction for the ailing dairy industry? By the way, in her newly published book, Life on the Other Border: Farmworkers and Food Justice in Vermont (University of California Press), Teresa describes the difficulties of immigrant farmworkers living near the Canadian border. . . .